I'm debating getting the $69 40GB + phoneline plan. The thing that gives me pause is that I've read some very poor reviews of Slingshot. However, most of those reviews were >1 year old. Some news articles I've browsed suggest that it's improved recently. What do you think? Is it better to pay a higher rate to a different provider? In reality each ISP has pros and cons, as well as ups and downs from time to time too. I have generally found Slingshot to have good support, and speeds a good (in excess of 15Mbps to AU & US) almost all the time on ADSL2+ connection. They cache a good amount of stuff (including P2P torrents), so anything that hits these will probably have line speed download rates. Latency for gaming is good, 47ms to Sydney from Christchurch. - Btw all consumer grade broadband is best effort and support is basic. You have to pay for a business connection for any guarantees of speed and premium support. I'm close to a cabinet, so get good speed and its pretty consistent. Cheaper than others too...although I haven't had a really serious look around. Been with them for 3 years. Only ever had 2 issues with them in that duration, but they fixed the issues within a day or 2 so I'm very happy with their service. As above been with Slingshot for a number of years, no complaints. Would recommend easily. 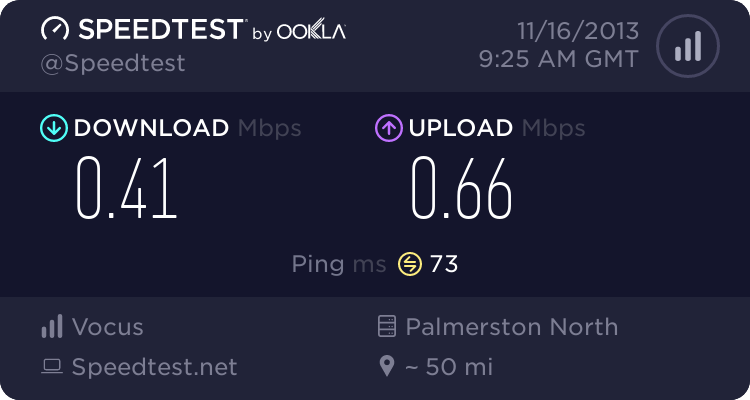 They've had their ups and downs over the years, but I can confidently say the current unlimited ADSL service is the best one that's ever been offered in NZ. I'm getting full line speed on virtually all downloads, including P2P, 24/7. Local latency is 4-5ms. Plus, if you're in the Better Network, you have the option to use Annex M, which I don't believe you get with any other ISP. Seeing I don't qualify for VDSL or UFB, I can't really see how there's any way I could get a better service than I currently am. Maybe if it were cheaper. Only one problem worth mentioning: I've moved house twice in the past year. At both new houses, I initially had awful speeds and latency after getting connected. Turned out I'd been put on a BUBA port at the exchange both times. After phoning them up and asking to be switched to EUBA (which they did immediately and without grilling me), all issues were instantly resolved. Don't think this is a Slingshot problem, more of a NZ's-aging-copper-network problem. UFB unknown if/when we're getting it, VDSL well you can't even get EUBA so theres a no go their either even though we live 200m from our towns exchange. Also stuck on BUBA, currently 2-3 mbps. During the day 12mbps, and online games won't play during the evening. Latency is decent though. Telecom have $75 for 30gb, or $85 for 80gb. In my experience I wouldn't go near Slingshot. Sure you're saving a few dollars but is it really worth it when you as a customer are debating about joining them? I'd rather pay for good internet that works with good speeds (provided you're not connected to a Conklin or an ASAM) than risk joining an ISP with a history with congestion and international traffic issues. I was expecting them to be a bit crap when I moved into the flat I'm in now. I have been pleasantly surprised, I'LL be signing up with them again for next year.